Development Lifecycle, Service Lifecycle - Do yours mesh or miss? The Application lifecycle has been with us - in various shapes - since the early days of IT. 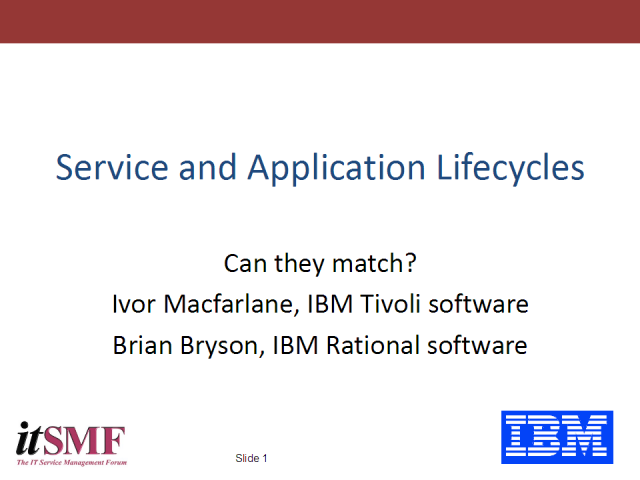 The service lifecycle was the flagship innovation of ITIL V3 in 2007. How do these two IT lifecycles fit together? Can they be integrated or are they competing ideas that simply create more silos in an industry that should be breaking down walls, not building more? This talk will explore what the two lifecycles really are while highlighting similarities, differences and ways of seeing them together. To most people it is obvious that the way we develop elements of a solution should integrate into the way we then deliver and maintain that solution. Marry that idea up with the need to integrate it all with business needs and line it up with strategy - business, IT, service and probably others too .. then it becomes clear how important it is to get it right. Integrating well can make a positive difference to efficiency and effectiveness while getting it wrong will generate even more nugatory effort and duplication. Learn how to evaluate the situation and set about gluing the parts together to build a bigger and better solution for your company. Title: Development Lifecycle, Service Lifecycle - Do yours mesh or miss?